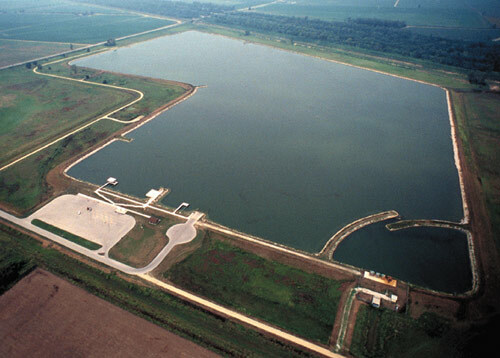 Jerry P. Combs Lake located in the Missouri Bootheel was constructed in 1996 and had serious water leakage problems. Missouri voters passed a 1/8 of one percent sales tax for conservation which provided funding for a Design for Conservation Program in 1976. One of the objectives of the program was to provide close to home public fishing opportunities for all Missouri anglers. Since 1976, the Missouri Department of Conservation acquired land and developed numerous recreational fishing lakes around the State of Missouri. The Bootheel area of Southeast Missouri was an area in need of public fishing water. The topography of the area is such that there is essentially no relief. Therefore, construction of a conventional lake was not possible. It was determined to design and construct an above ground lake and drill an irrigation well for pumping. In January 1993, a 1,036 acre tract of land, named the Little River Conservation Area, was purchased for the construction of the lake. The land was located in Dunklin and Pemiscot Counties near the community of Kennett, Missouri. The project was given high priority and the decision was made to hire a consulting engineering firm to design the lake project. An agreement was signed with a consulting engineering firm in May of 1994 to provide site surveying, soils investigation, design, and construction inspection for the project. The surveying, soils investigation, and design were completed by early 1995 and construction was initiated in April 1995. The project design featured a 150-acre above ground lake with an average water depth of eight to ten feet. The project also included 181 acres of constructed wetlands adjacent to the lake. A levee more than two miles in length and twelve feet in height was designed to encircle the lake. The wetlands were designed to be constructed by controlled excavation of borrow material for construction of the perimeter levee for the lake. The lake site was underlain by a layer of highly impervious clay, six to ten feet in thickness. Beneath the clay, there were very permeable saturated sands hundreds of feet in thickness. 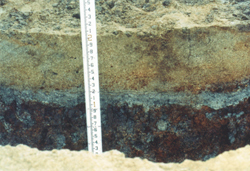 The success of holding water at the site depended on the continuity of the clay layer. Any connection between the lake water and the underlying sands would spell trouble. Construction of the project was completed in July 1996 at a total cost of $3,520,439 including engineering and construction ($2,969,656 for construction and $550,783 for engineering). In August 1996, the lake was named in honor of former Missouri Conservation Commissioner, Jerry P. Combs, who resides in the nearby community of Kennett, Missouri. There was a large project dedication ceremony and the well pump was turned on to begin filling the lake, a process that was estimated to take six months. Jerry P. Combs Lake at full pool in 1999 after repairs were made to seal the lake bottom. January 28, 1997, a site visit with the consulting engineer and contractor was scheduled to handle some post construction details. Upon inspection of the lake, the water was found to be about three feet deep and it appeared that the lake was not filling at the anticipated rate. Monitoring of the lake water level was initiated immediately. The monitoring revealed that the lake was losing water at the rate of about one inch per day or 2,500 gallons per minute. At a lake water depth of three feet, seepage looses were more than 50 times the design seepage loss calculated for nine foot average water depth. The monitoring revealed that the lake was losing water at the rate of about one inch per day or 2,500 gallons per minute. The story of the leakage problem of the lake was of major concern to the Missouri Department of Conservation and caught the attention of a very supportive local newspaper, the Dunklin County Democrat. Local residents were very disappointed but also hopeful and confident that the Missouri Department of Conservation could find the problem and repair the lake. The concrete spillway structure where deep excavation was required for the construction of the footings. A tree lined drainage ditch in the northern portion of the lake where trees were dozed. It was possible that the excavation of the root wads of the trees or the ditch may have intersected the underlying sands, providing a connection to the lake. A drainage ditch in the southern portion of the lake that may have intersected the underlying sands. A possible abandoned irrigation well in the lake bed could provide a connection to the underlying permeable sands. Piezometers were established at various locations around the perimeter of the lake in an attempt to identify a point source seepage problem. Monitoring of the piezometers revealed no clues, but supported the idea that the leakage problem was relatively uniform seepage rather than a point source. The permeability numbers for the clays underlying the lake were carefully reviewed, but the rates of seepage which were being monitored in the lake made no sense. 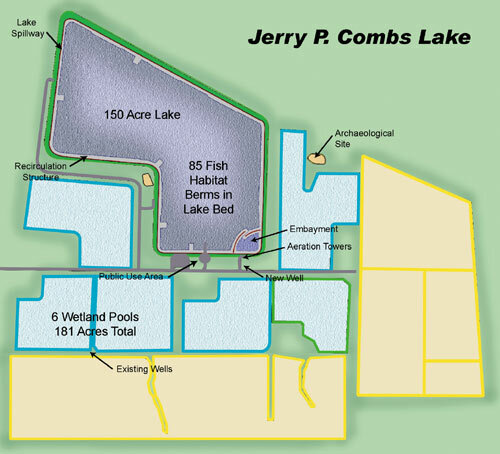 The breakthrough in the leaky lake mystery occurred when a joint team of investigators from the Missouri Department of Conservation, the consulting engineering firm, and the Missouri Geological Survey assembled at Jerry P. Combs Lake, July 21, 1997. A geologist of the Missouri Geological Survey had been performing earthquake research in Southeast Missouri and had a theory that earthquake-induced sand-filled fissures could exist at the site. The geologist's theory was correct as sand fissures were quickly discovered in a backhoe exploration pit adjacent to the lake. The discovery of sand-filled fissures which connected the lake and the deep underlying permeable sands was the breakthrough in solving the leaky lake mystery. There had been at least three New Madrid Earthquakes measuring above 8.0 on the Richter scale, which erupted in the region from December 1811 through February 1812. These were the largest earthquakes in history of the United States and the epicenters of the quakes were within 30 to 40 miles of Jerry P. Combs Lakes. The region was sparsely populated at the time and few deaths were reported. However, the power of the earthquakes was evident. Witnesses said the land rolled like ocean waves. Huge crevices opened in the soil and new lakes, islands and streams were wrenched into the landscape. The quakes rang church bells on the East Coast. They split stone houses and toppled chimneys in the frontier town of St. Louis. Theory has it that the New Madrid Earthquakes caused the six to ten foot thick clay layer present at the site of Jerry P. Combs Lake to crack and the underlying saturated sand to liquefy. It is believed that the sands were forced upward through the diagonal clay fissures to the ground surface. In the nearly 200 years following the earthquakes, it is theorized that a thin layer of soil has been deposited or formed at the surface masking the presence of the sand. It is anticipated that literally thousands of these tiny sand-filled fissures, also known as sand veins, could be present at the lake site. 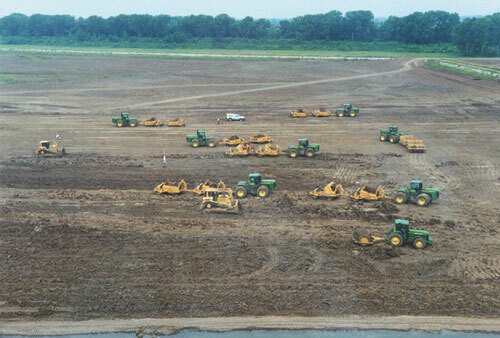 Construction of the clay liner begins in the lake bottom in 1999. A plan was developed by the consulting engineering firm and the Missouri Department of Conservation to correct the influence of the sand-filled fissures by mechanical manipulation and recompaction of the soil to some depth below the ground surface. It was believed that the sands could be thoroughly mixed with the predominant clay soils by deep plowing and recompacting the lake bottom. Calculations indicated that the resulting compacted soil mixture, twelve inches in thickness, would be highly impermeable and would be a solution to the lake seepage problem at a reasonable cost. Theory has it that the New Madrid Earth-quakes caused the six to ten foot thick clay layer present at the site of Jerry P. Combs Lake to crack and the underlying saturated sand to liquefy. By September 1997, the plan was ready for action. The lake bed was aerially sprayed with herbicide to kill the extensive vegetation which had developed. The vegetation was subsequently burned. Deep plowing of the ground surface began, but soon extensive sand deposits, varying from three inches to two feet in thickness were discovered just below the ground surface. The repair attempt was soon discontinued as exploration revealed the sand deposits over an estimated 20 percent of the lake. During the soils investigation of the project, the sand-filled fissures were not discovered or identified as such. It was determined that a new plan was needed and repair costs would be much higher than originally expected. Missouri Department of Conservation staff outlined a new repair plan to the Missouri Conservation Commission in February 1998 with an estimated cost of $700,000 to $1,100,000. The plan entailed removal of the shallow sand deposits and construction of a clay liner over the entire lake bottom utilizing on-site clay. Funds were not available for the repair at the time and a decision was deferred for two months. Repair is nearly complete as the clay liner is constructed in the final compartment of the lake. In March 1998, The St. Louis Post Dispatch newspaper got word of the Leaky Lake problem in the Missouri Bootheel and ran a front page story in their March 8, Sunday edition. The repair plan was presented in detail to the Conservation Commission in April 1998. The risks of failure were explained and the Commission was made aware that there was certainly no guarantee of success. It was possible that the extent of sand deposits could be so great that the sand and clay could be intertwined throughout the lake bed making it impossible to separate the materials. If this condition were to occur, all clay would need to be obtained from outside the lake and the cost of repair of the lake would increase tremendously and completion in one construction season would be unlikely. This situation could make the project infeasible. The Conservation Commission voted to authorize the repair of Jerry P. Combs Lake and one month later, May 1998, approved the funding to begin to repair the lake in the Spring of 1999. Because of the funding situation, the repair plan was put on hold for nearly a year. Meanwhile, the St. Louis Post Dispatch news story spread throughout the state and the Leaky Lake problem garnered a great deal of attention. The story was obviously a novel one as phone inquiries came in weekly from the media including the Wall Street Journal. There were many phone interviews for newspaper, radio, and television. During this time period, NBC Nightly News also caught wind of the Leaky Lake in Missouri and developed a keen interest in the story. Following numerous telephone discussions, NBC decided to do a television news story. February 24, 1999, an NBC film crew from Chicago and a reporter from Atlanta arrived in Kennett, Missouri to interview local citizens for the story. Most local citizens they talked to were disappointed in the leaky lake but were still hopeful. The following day the film crew met with Jerry P. Combs and Bill Lueckenhoff, Missouri Department of Conservation Engineer, for interviews and filming at Jerry P. Combs Lake. The story was initially scheduled to air on NBC Nightly News, Friday, February 26, 1999. Because of its controversial slant and concerns of Jerry P. Combs and the Missouri Department of Conservation, the segment was temporarily halted. However, two weeks later, March 12, 1999, The Missouri Department of Conservation received two hours notice that the story would air that evening on NBC Nightly News. Meanwhile, in February 1999, the Conservation Commission approved hiring an independent experienced geotechnical consulting engineer with expertise in major levee inspection and design to review the new Missouri Department of Conservation repair plan. The engineer approved the plan and prepared a report. In general, the plan entailed removal of the shallow sand deposits and construction of a clay liner over the entire lake bottom utilizing clay from within the lake bed. It was essential that a protective layer of compacted clay be in tact over the entire lake bottom, under the constructed fish habitat berms, in the existing ditches, and around concrete structures for the lake to successfully hold water. Approximately one-half million cubic yards of earth would need to be moved and compacted. It was essential that a protective layer of compacted clay be in tact over the entire lake bottom, under the constructed fish habitat berms, in the existing ditches, and around concrete structures for the lake to successfully hold water. The plan involved stripping the top four inches of soil and utilizing it for construction of fish habitat structures in the lake bed. It was the opinion of the Missouri Department of Conservation that the stripping alone would not uncover a decisive amount of sand. Therefore, the extent of the sand deposits would not likely be known until encountered in the construction work. Following stripping, 18 inches of soil would be excavated. The excavation would then be backfilled with compacted clay from the adjacent portion of the lake bed. If a sand deposit was encountered, the excavation would be extended to a minimum of 30 inches in depth prior to backfilling. The repair plan was to divide the lake bed into eight compartments. Each compartment would be backfilled utilizing clay from the adjacent compartment. Three test levees approximately six feet in height were to be constructed across the lake bed to allow testing of seepage losses of the completed compartments during construction. Small levees approximately two feet in height were to be constructed between the remaining compartments of the lake bed. Because of the very high shrink/swell characteristics of the clay, it was imperative that the completed clay liner be kept wet to prevent discussion cracking. Cracking could jeopardize the integrity of the clay liner and the success of the repair. 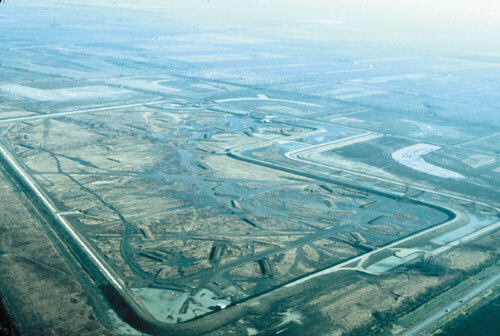 Immediately following completion of construction of the clay liner in each compartment of the lake bed, the completed area was to be inundated by pumping water from the water supply well. In March 1999, Missouri Department of Conservation staff began moving on-site to begin preparations for repair of the lake. January and February were very wet in Southeast Missouri and some areas of the lake required draining before construction could begin. It was estimated that construction would be completed by Thanksgiving. After a wet winter and spring, the construction work progressed very well in late May and June. Because of the characteristic of the clay to rapidly develop desiccation cracks, the size of the construction compartments was reduced during construction. The construction resulted in a total of 19 compartments averaging less than ten acres in size, rather than eight that were originally planned. Thanks to favorable, dry working conditions, construction progressed at such a rapid pace that it was impossible to appropriately test the water holding success of the clay liner during construction. Monitoring was attempted in short time segments and at one point the field staff believed that the lake was still leaking. Certainly, staff members were quite nervous throughout the project as television, radio, and newspaper interviews continued to cover the high profile project on a regular basis. Construction of the clay liner was completed August 26, 1999 nearly three months ahead of schedule. During the repair project, 396 sand deposits were identified in the lake bed. Following the repair work, there were 194 fish habitat berms in the lake compared to 85 in the original lake. 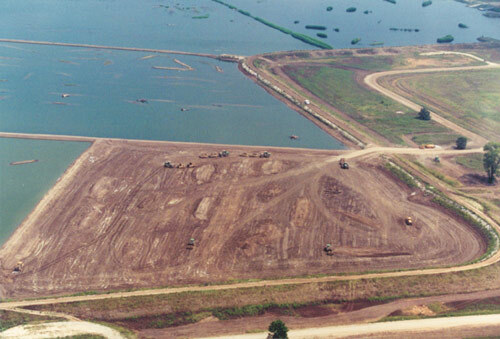 The wetlands adjacent to the lake had been expanded from 181 acres to 204 acres because of additional borrow material required for constructing the clay liner in the final section of the lake. This article was reprinted with permission from the Association of Conservation Engineers 40th Annual Conference proceedings. For more information contact Bill Lueckenhoff at the Missouri Department of Conservation, P.O. Box 180, Jefferson City, MO 65102, (573)522-2323, fax (573)522-2324.